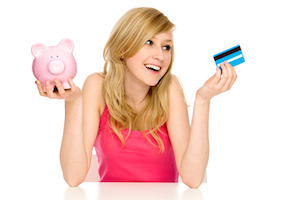 Should I Give My Teen a Credit Card to Use for Emergencies? If you’re the parent of a teenager, the world might look like a scary place. There are so many ways your kids could wind up in trouble, it’s understandable that you’d worry about their safety. This is why many parents of teens consider giving their child a credit card to use in case of emergency. But there are a lot of factors to consider. Take a look at the information below to decide if this move is right for your family. There are a lot of ways to share credit with others, but the Nerds recommend making your teen an authorized user on your credit card account and then giving him a card to carry. In this scenario, you’ll be the primary cardholder on the account, and he’ll be able to make purchases with the card. There are several benefits to this approach. For one thing, you’ll be helping create a positive credit history for him, assuming you’re spending responsibly and paying your bills on time. This is because any activity that occurs on the card will be reported to the credit bureaus for each of the people listed on the card’s account. Also, your child will easily be able to use the card if an expensive emergency arises because the card will be issued in his name. In other words, you won’t have to worry that your child will be hassled by an auto repair shop or a hospital because he’s carrying a card with your name on it. Plus, credit cards are much safer than cash because you won’t have to worry about the money being lost or stolen. Although there are advantages to making your child an authorized user on your account, there is definitely the potential for problems, too. For instance, it’s critical to understand that if you make your child an authorized user, you are entirely responsible for making the payments on the card – no matter what. Your credit card company considers you to be the person primarily responsible for the account, so when your child charges, you have to pay up. And this is how giving your child a card can become problematic – if he makes a series of frivolous purchases that you can’t pay off in a month, you could end up in debt. Obviously, you’d take the credit card away if this happened, and this could cause an emotional rift between you and your teen. It’s important to evaluate your child’s level of maturity before handing over the plastic. If your teen is conscientious and responsible, it might be a good idea. If he’s impulsive or careless, it’s probably best to hold off until you have more confidence in his ability to spend wisely. If you decide to give your teen a credit card, there are some ground rules to establish before you move forward, no matter how trustworthy he is. What to do if the card is used – do you expect your child to tell you as soon as he has made a charge or will you discuss it when the bill arrives? What will happen if the card is misused – will you immediately take it away? Will you make him pay for the charges? After you’ve given the card to your child, be sure to monitor his spending carefully and question charges you don’t understand. In addition to keeping your teen safe in the event of an emergency, this is also an opportunity to have an ongoing discussion about financial responsibility. Finally, if you’re still a little wary of giving your child a credit card, consider getting a card that will allow you to set a spending limit for authorized users. For example, American Express charge cards (like the Green, Gold, Centurion and Platinum) will let you cap the authorized user’s spending and give you the flexibility to change the cap whenever you want or need to, as of the time this story was published. The takeaway: Making your teen an authorized user on your credit card account is a good way to give him access to credit in case of emergencies. Just be sure you know what your responsibilities are as the primary account holder and make your expectations clear. This will help avoid a lot of the pitfalls that could come with letting your child use your credit.